The Sacred Page: Paper on Pope's Visit: "This was the End of the British Empire"
Paper on Pope's Visit: "This was the End of the British Empire"
Whoa! Check out this reaction to the papal visit from one English paper (citing another). This visit is becoming of such historical significance it is hard to keep up with all the firsts. Indeed, if you want evidence of the self-confidence of our Catholic national identity, look no further than Westminster Abbey and Westminster Hall. For at least the first 500 years of its existence – we can’t be sure when it was founded – the Abbey was obedient to Benedict’s predecessors. So for the Pope to enter it today was an affirmation of its own “foundational act”. Not for nothing did he point out in his address that the church was dedicated to St Peter. Even Catholics who would never be so crude as to say “the Abbey belongs to us, not to you” sensed that history was being re-balanced in some way. They realised that the Pope had as much right to sit in that sanctuary as the Archbishop of Canterbury (who, to be fair, showed the Holy Father a degree of respect that implied that he, at least, recognises the spiritual primacy of the See of Peter even if he rejects some of its teachings). Of course I’m not denying that for centuries anti-Catholicism was central to English self-understanding, even if it took nearly a century of harrassment and persecution to suppress the old religion. And there are still pockets of intense hatred of Rome in English society today. The difference is that the only anti-Catholics with influence are secularists who aren’t interested enough in the papal claims even to find out what they are. (I’m thinking of Peter Tatchell’s amazingly ignorant Channel 4 documentary.) They hate religion and they pick on Catholics because they’re the softest target. Protestant anti-Catholics, in contrast, don’t have mates in the media or useful allies in the Church of England. All they can do is watch in horror as the Pope of Rome processes into the church where Protestant monarchs are crowned, declares unambigously that he is the successor of St Peter with responsibility for the unity of Christendom, and then walks out again – to hearty applause. To be honest, I’m still not quite sure what to make of it all myself. 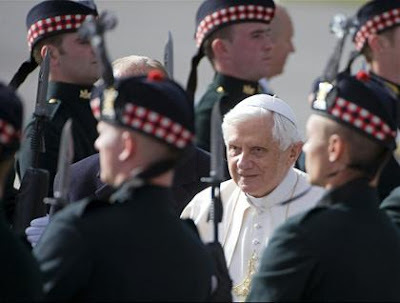 Benedict XVI’s speeches are worth reading several times; they often turn out to be more radical than they first appear. But one thing is for sure. Despite the unassuming courtesy of the Pope’s manner, he didn’t give an inch.